Fred Freedman, MD was a Neurologist at the South Bay Medical Center in Harbor City, CA. In semiretirement he works per diem at the Geriatrics Cognitive Assessment Program within the Continuing Care Department. Dr Freedman’s artistic life was inspired by his mother, an artist, who also encouraged him to have a “day job.” Now in semiretirement, he has more time to pursue his artistic interests. Dr Freedman says he feels he’s trapped in a style of about 100 years ago, which makes him postimpressionistic and that’s okay with him. 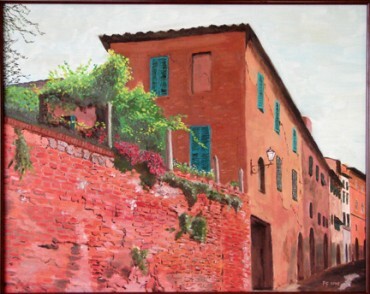 Siena Street Scene is based on a photograph from a trip to Italy. Siena, with its winding medieval streets, is a favorite city.